If you have moved or removed the factory rear license plate bracket on your Wrangler JK 2007-2018, you will notice a small space that has been uncovered. A Mopar factory rear license plate deletion panel will seamlessly cover this small space. 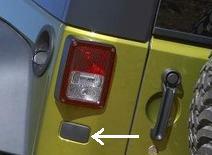 The deletion panel is easy to install and is designed to look like a factory-design feature on Jeep Wranglers. Used to fill in the open spot after placing license plate on spare tire. Works well, looks great.